Friendly forces must defend Naval Station Newport against numerous waves of enemy forces. 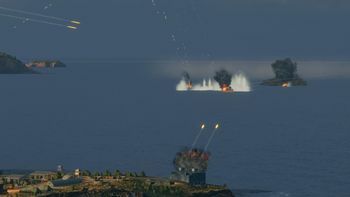 Defense of Naval Station Newport is a PVE Scenario which has the friendly task force defending a base against enemy attack waves. Players are tasked with preventing the destruction of essential onshore installations and support ships. Players may take any Tier VI ship. The allied force consists of 7 human players and bots. Secondary "All onshore installations and support ships at the base must survive." Allied shore installations and support ships survive the scenario. Secondary "Don't allow enemies to enter your main defense perimeter before the main attack starts." No enemy forces enter the base perimeter prior to the main attack. 1. If previous objective is failed: "Destroy enemy aircraft carrier Koku-Bokan." 2. If previous objective is accomplished: "Defend allied aircraft carrier." 2. Allied aircraft carrier survives the scenario. Secondary "Ensure at least three ships in your task force survive until the arrival of the allies." 3 or more player ships survive until reinforcements arrive. Secondary "Destroy all enemy ships before the main attack starts." Destroy all enemy ships prior to the main attack beginning. Players will spawn in the south-eastern corner of the map within Naval Station Newport's perimeter, designated by a green circle on the mini-map. Initial friendly forces consist of the seven player ships, three outer gun batteries, two (damaged) inner gun batteries, three surveillance stations, two Liberty maintainer ships, one St. Clair communications ship, and three generic base structures. Near the start of the battle, the two Liberty ships will move out to repair the two innermost gun batteries, and damaged ships can move within the green aura around them at any time to slowly recover their health. When the battle begins, the first enemy ships of the preliminary waves will spawn and begin to sail towards the base. The first wave may spawn around any one of the three surveillance stations but the second and third waves can only spawn at a station adjacent to the previous one, which may be helpful to a defender for positioning for each attack. 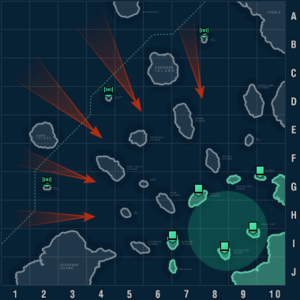 If any of these ships breach the main defense perimeter or are not sunk before 10:00 (excluding Zuiho), the corresponding secondary task will be failed and the main attack will begin immediately. It is impossible to obtain 5 stars for the Operation if this occurs. If the base is successfully defended before 10:00, Romeo, a Lexington-class aircraft carrier, will then spawn at either the south or east edge of the map and begin to flee towards the base, quickly being following by an enemy Aoba and Nurnberg. Ensuring Romeo's survival is another secondary objective, and if the pursuing cruisers can be dealt with, the carrier will remain around to offer its own strike aircraft in the defense of the base. The main attack will often spawn not long after Romeo does, however, which can complicate rescue efforts, especially if players are not in a position to readily defend her. The contents of the main attack wave differ slightly depending on whether all previous secondary objectives were achieved. If all enemies are sunk before breaching the base, the main attack will contain an Izumo-class battleship (Kousotsu). Otherwise, the main attack will contain a Hiryu-class aircraft carrier (Koku-Bokan) and the Aoba and Nurnberg that would have spawned in pursuit of Romeo. Sinking the Hiryu is considered an additional secondary objective. Regardless of whether the main defense perimeter is breached, a straggler wave may appear tailing behind the main attack. Once all remaining enemy ships have been sunk, the mission will be completed. First: Kuma, Yūbari, Tenryu, Chikuma. Second: Isokaze, T-22, Kaiser, Ishizuchi, Zuiho. Third: Ernst Gaede, Fubuki, Hatsuharu, Aoba, Nürnberg, Furutaka. Center: Leberecht Maass, Shiratsuyu, Izumo (Kousotsu). Center: Leberecht Maass, Shiratsuyu, Hiryu (Koku-Bokan). Firepower is paramount in this operation. It is recommended to use a carrier and four cruisers. The most preferred choices are Ryujo and Cleveland, but most Tier VI ships will perform well. For the remaining slots, a single destroyer may be useful for spotting, but otherwise, battleships tend to be more effective. This page was last modified on 19 December 2017, at 20:45.